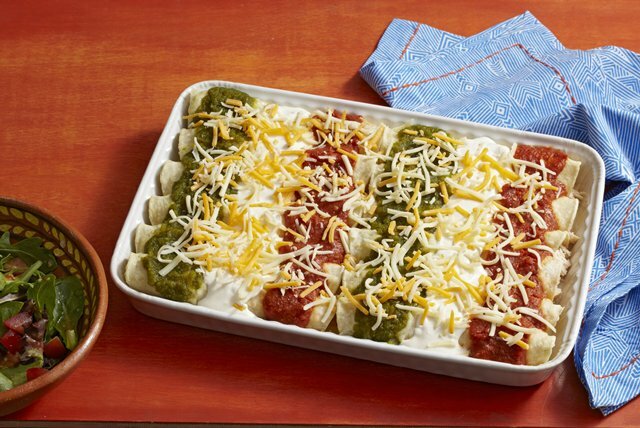 Topped with green, white and red sauces, these enchiladas are ideal for Cinco de Mayo and other Mexican-themed celebrations. Blend 1 cup broth, poblano chiles, 1 Tbsp. onions and 1 garlic clove in blender until smooth; transfer to saucepan. Blend 1/2 cup of the remaining broth, remaining onions, remaining garlic clove, tomato sauce, chipotle peppers and oregano in blender until smooth; pour into separate saucepan. Combine remaining chicken broth, sour cream and 1/2 cup cheese in separate saucepan. Cook poblano and chipotle sauces on medium heat 5 min. or until heated through, stirring frequently; keep warm. Cook sour cream sauce 3 to 4 min. or until cheese is melted, stirring constantly. Top tortillas with chicken; roll up. Place, seam sides down, in 13x9-inch dish. Top with sauces, alternating colors to resemble the Mexican flag. Sprinkle with remaining cheese. Poblano and chipotle sauces can be made ahead of time. Keep refrigerated. Reheat before using as directed.